NEW YORK -- The formerly conjoined twins who were separated nine weeks ago at a New York City hospital have been released from the hospital. Jadon and Anias McDonald - now 15 months old -- are headed to Blythedale Children's Hospital in Westchester, New York, to receive specialized rehabilitation treatment. They were met with a parade of fanfare as they left Children's Hospital at Montefiore in the Bronx. The boys were born conjoined at the brain and skull. On October 14, doctors performed a more than 20-hour surgery to separate them. The surgery was deemed successful, despite some post-surgery setbacks. 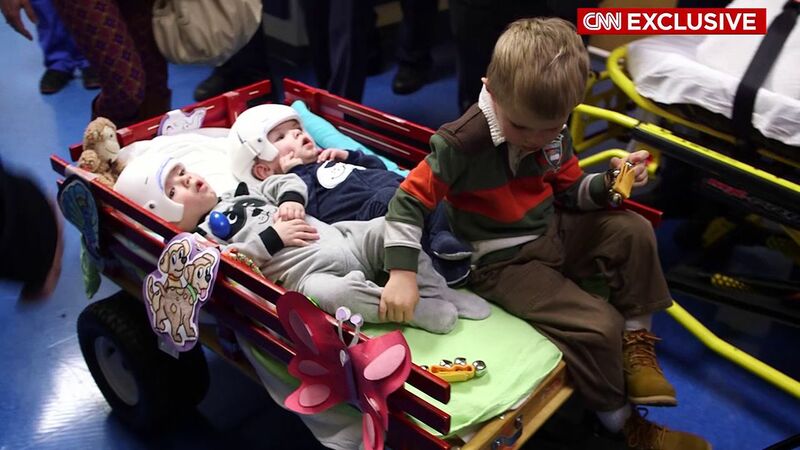 The boys developed infections, and Anias developed seizures - not uncommon after conjoined brain separation surgery. "The McDonald family and these children have shown strength and determination that is really quite extraordinary," said George Ofori-Amanfo, chief of the Division of Critical Care Medicine at Children's Hospital at Montefiore. But the hospital said the boys are doing well. They're breathing on their own, eating and interacting with their family. Jadon and Anias are often smiling and are able to look at each other, play together and hug one another. "Jadon and Anias continue to surprise us every day," said Dr. James Goodrich. "As one of my most difficult cases, we knew recovery would take time, but we are all amazed by how well the boys are bouncing back and are confident they will continue to achieve new milestones at Blythedale." Nicole McDonald, the boys' mother, said she's eager for them to move on to the next phase of their recovery. "This is a bittersweet day for us," said McDonald. "We are so proud of the strength our boys show us every day as they progress in their recovery, and we are looking forward to seeing them thrive in rehab." The McDonald twins were the seventh successful conjoined-at-the-head separation surgery that CHAM has performed.